Cantilevered Bridge: What Is It? The most common description and use of a cantilever bridge is a bridge product that is configured to treat, usually, the end of an arch where the missing tooth (teeth) has no adjacent tooth to anchor a normal bridge to. The bridge is designed to fit on 2 or 3 teeth (or implants) the precedes the missing tooth. The tail end of the bridge hangs in suspension off of the last anchor device and fills the space with a pontic (bridge tooth). Pictured here is the extreme case where a patient treats all tooth extractions with traditional dental implants. This massive number of implants provides the assurance that the critical value of healthy bone stimulation provided by root form implants literally stimulates the entire jaw. Younger patients, more so than older patients, are attracted to dental treatments that can preserve precious jaw bone for a lifetime. Older patients who perhaps have already acquired "spots" of bone loss throughout their arch may not need implants in those areas. Other patients focused on getting good bridge dentistry with fewer implants can scale down the number of implants to 4 or 6 (better) for a full arch. Cost and surgery are common factors for determining what is best for each patient. Typically, there will be two anchor implants at the end of the arch. Older patients may elect to have a shorter arch or resorbed bone in those locations (normal for older patients) may dictate having a shorter arch. The other two implants are usually placed in the anterior sections of the bridge, equidistant when possible, for maximum support. When a total of six implants are used, they are placed in correspondingly similar positions, given that bone is healthy or can be rebuilt or augmented. Nobel Biocare has been a major influence in advancing tooth replacement technologies that give patients more options for replacing teeth where there is minimal or spotty bone conditions throughout an arch. The All On Four and Teeth In An Hour (both trademarked by Nobel Biocare) is a proprietary treatment paradigm that uses cone beam catscans and CAD/CAM equipment to design porcelain or acrylic bridge prosthetics that can take the best advantage (or create the advantage) of a patient's jawbone characterstics. Nobel's bridge designs have become a popular treatment choice for patients who can no longer wear dentures comfortably... or they no longer want dentures. The adjacent photo (provided by Dr. Rick Winter, Milwaukee WI) shows the underside of a cantilevered bridge. Notice how the end implants are not placed at the end (bone conditions do not permit). The use of special metallic alloys and basic principles of cantilever physics enable this custom bridge to deliver the biting, chewing and normalized bite properties of a full arch of teeth. The 2nd, restorative view of this custom tooth replacement show a full adult arch of twelve (12) teeth. 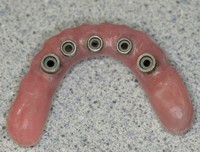 The metal components of the implant screw retained mounts can be seen along the bottom edge. The implant devices are strategically placed to create the cantilever advantage (dental physics). Notice the slight angulations used on some of the implants. This design provides the rock solid support for the hybrid metallic infrastructive that the porcelain (or acrylic) restoratives are built upon. The adjacent xray photo (Dr. Ara Nazarian, Troy MI) is a representation of how implants placed in the anterior region of the lower jaw (this jawbone area is the most dense compared to all other areas of the jaw). The metal alloy bridge underframe can be seen to suspend off of the series of implants. Most cantilevered bridges with this type of design can support 10 or 12 restorative teeth (porcelain or acrylic), providing excellent function and a quite dramatic cosmetic outcome. Misch Implant Institute is just one of the Post Graduate training programs that provide unique training to dentists who continually seek new and improved ways of using existing technologies while remaining on the bleeding edge of things yet to come. These doctors are responsible for creating tooth replacement solutions that were impossible to achieve for many patients just a few years ago. Bone grafting products, autogenous tissue harvesting techniques, laser assisted periodontal therapies, advanced antibiotics, CAD/CAM science and the latest in 3D Imaging diagnostics enable a growing number of dentists to treat a number of conditions that historically had few options. Patients with severe gum disease that has caused radical losses of bone, periodontal tissues and teeth can often become candidates for cantilevered, full sets of new teeth. Long term denture wearers also can have more options for retreatment...even in situations where they have been told they "have no bone." Ridge splitting and chin block and ramus grafts have been beneficial for creating cantilevered implant systems in jaws that were once considered bereft of useable jawbone. Denture patients who no longer want teeth that are removed every day. Patients who have been wearing dentures not for a lifetime but perhaps a few years are frequently ideal candidates for getting new porcelain or acrylic teeth that are permanently fixed into the jaw.